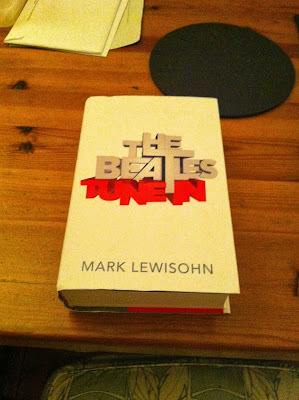 I'm 540 pages into Tune In, first volume of Mark Lewisohn's three-part biography of The Beatles. In case you think that's a lot, bear in mind it's just over halfway through volume one. There's another three hundred pages to go and that will only bring me up to 1962. There have been hundreds of books about the Beatles but nothing as comprehensive as this. I've read quite a few of those books. I'm not a Beatles completist or even much of an anorak. I've met enough anoraks to know nothing satisfies them. It could be that some of the details in this book have already been published before in somebody's memoirs. I wouldn't know that. Nor would you, in all likelihood. I know more about this subject than most people and yet I can open this book on almost any page and find something I didn't know, have never had confirmed or have never realised the full significance of before. Because you know some of what's going to happen later on in the as yet unwritten Volumes Two and Three, then every tiny detail, every little decision, every road not taken, is pregnant with significance. A few examples: on page 493 I learn that Richie Starkey, already quite a successful working musician with Rory Storm and The Hurricanes, wrote to the Chamber of Commerce in Houston, Texas, enquiring about the opportunity of factory work. (Throughout this book people write actual letters to each other.) He picked Houston because of its association with Lightnin' Hopkins, whose music he had heard on an LP brought back from Hamburg by Gerry Marsden. On page 314 I learn that the Silver Beetles were offered the chance to tour Scotland with Johnny Gentle provided they could be in Alloa in two days. They got the offer on Wednesday, persuaded a 28-year-old drummer they had never used before to go sick from his job and join them, rehearsed on the Thursday and were on-stage at Alloa Town Hall on Friday night. It goes without saying that this was without mobile phones, probably without fixed line phones. On page 396 I read about how Astrid Kirchherr and Stuart Sutcliffe took the seventeen year-old George Harrison to the railway station in Hamburg when he was deported. They gave him some sweets. He hugged the pair of them. "This was the sort of demonstrative thing they never did." On page 505 I learn that John and Paul were given their distinctive haircuts by their German friend Jurgen Vollmer in the Hotel De Beaune in Paris. They were trying to emulate the appearance of Parisian youth, put some distance between The Beatles and all the Brylcreem bands back in Liverpool and establish a group look which the rest of the band would have to adopt. George did. Continuing his policy of sullen non-cooperation, Pete Best didn't. The most musically accomplished member of the band ended up playing the bass. He didn't want to. He considered it "the fat man's instrument" and preferred guitar or piano. When Stuart Sutcliffe left it was clear that Lennon wasn't going to take it up and so McCartney did, for the good of the group, at a stroke making them twice as musical as any band in Britain. After they'd played their second Hamburg residency they were the most performance-hardened band in Europe. Tony Sheridan says "they were the best rhythm and blues band I've ever heard". Lewisohn estimates their total stage time in Hamburg at 918 hours. Most bands today spend the majority of their time waiting to play. The Beatles spent more time on-stage than off. They didn't practise. They performed. One of the reasons they were so good was that they were forever learning new material. When a hot new song came out they would cover both sides, which meant that they spent years deconstructing how big hits were written before doing their own. They didn't quickly graduate to writing their own songs. In fact, at the point that Brian Epstein signed them they had stopped. Bob Dylan says that he doesn't remember the 60s but he does remember the 50s. This book's a bit like that. It's difficult to imagine how the subsequent volumes can be as good because they will be dealing with the world after Beatlemania, which we all like to feel we either lived through or recognise. Tune-In is different. It's set in the pre-deodorant, pre-central heating, pre-Radio One, pre-credit card, pre-car ownership world of cigarette smoke, smog, hire purchase, greasy overalls, bare wires held in the socket with matchsticks, National Service, rubber johnnies, suspender belts, Scotch and Coke and standing for the national anthem. Nothing was convenient. Furthermore there was no road map for where this group could go. Before the Beatles there weren't even that many groups in Liverpool and Liverpool had more than most. They couldn't look at an established act and think they'd like to be a bit like them. They couldn't aim at a niche. There were no niches. Before them there was nobody like them. After them it was difficult to imagine things being any other way. They had a unique combination of single-minded ambition and sod-this impulsiveness. Time and again they were on the point of breaking up when something came up: a tour of Scotland, some gigs in Hamburg, the money to buy an amp, Brian Epstein. Probably the only thing that ensured they would keep going was John Lennon's lack of an alternative. What you get from this book is that sense of possibility, the world as they experienced it, through a succession of instants, rather than as the recapitulation of a time-honoured legend. I shall keep reading. In a way I don't really know how it's going to turn out. I'll be talking to Mark Lewisohn as part of our Word In Your Ear evening at the Old Queen's Head on October 9th, We'll also have Bob Stanley talking about his book Yeah Yeah Yeah and music from Mr B The Gentleman Rhymer. Tickets on sale here. Hope to see you there, by which time I will have finished the book. Are you reading the regular or the £74 special extended version? Should I know, or do I assume the other two volumes, should Mark live that long, are to be titled Turn On and Chill Out? A left handed drummer playing a right handed kit, as his mum didn't want the stigma of being a southpaw on show. A rhythm guitarist relying on banjo/uke chords shown to him by his mother. I really enjoyed Allan Williams' The Man Who Gave The Beatles Away; co-written I know, but still it had the insight on those early days from someone who was there. I will, of course, look forward immenseley to the 'new' trilogy. Where did that e come from? Must say I'm underwhelmed by the cover. It looks like the kind of thing you'd see used in the tv advert for a late 80s compilation album. the third (Drop Out?) being the 'white book'. Simply from a marketing standpoint shouldn't the definitive Beatles biography have a picture of the band on the cover? Perhaps this is designed to assault the eye as you walk into Waterstones or, more likely, Tesco. The American cover appears to be more subtle and something you could live with on the proverbial coffee table. THEY didn't know that P&J had even stayed there. Why would anyone volunteer to direct a film?